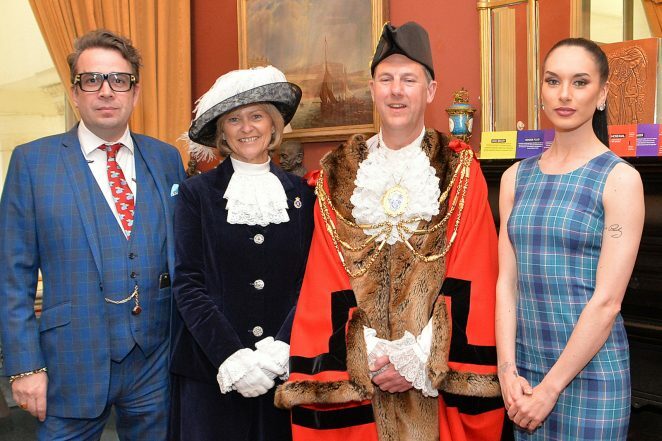 Brighton based designer and tailor Gresham Blake was recently approached by the Mayor’s office, to design a bespoke civic robe for the Mayor of Brighton and Hove Councillor Pete West. The Mayor had previously met Gresham when arranging the certification of a newly designed Brighton and Hove tartan. The new tartan was produced as a result of Gresham’s consultation with clients and is designed to reflect the city’s rich culture and flamboyant history. Our photograph shows the Mayor in his new robe, together with Gresham Blake. the High Sheriff of East Sussex, Maureen Chowen and a model wearing a dress made of the Brighton and Hove tartan. The tartan has been officially certified by the Keeper of the Scottish Register of Tartans. Its colours hint towards these things: a mixture of blues (the sea), greens (South Downs), gold and pink (the city’s flamboyance); it is exclusive to Gresham Blake. Nice tartan. Shame about Gresham’s suit. Very interesting. An unusual piece of history well worth recording. As a Brightonian now living in the Highlands of Scotland I am delighted to see a tartan designed especially to represent Brighton. I am curious as to whether it is made of wool or silk. And, where can this tartan be bought?